Satu Mare’s most attractive building is Hotel Dacia – former Hotel Pannonia – located in the city centre opposite the city park. It was built on the spot where the former town hall was located and construction was begun in 1901. The building shows the style of the secession and was influenced by the works of Ödön Lechner. The ornaments, which come from Hungarian folk culture, were produced in the famous Zsolnay factory in Pécs. The building has two representative halls, a ball room and a concert hall, in which Satu Mare’s philharmonic orchestra “Dinu Lipatti” holds its concerts. Acoustics and interior design of the room are unique. Today, the former hotel is in bad condition. Though a narrow passageway close to the hotel, one can reach a little square which holds the old fire department tower from 1904. The tower can be accessed and once on top, the beautiful panorama of the city unfolds. The construction of the tower was initiated by Roman-Catholic bishop Gyula Meszlényi. It was restored recently and is one of the city’s main sights. When continuing on the passageway and turning left, one can see a residential building made of brick. The yellowish brick stones have been written on with pencils and show names and dates which are hard to read nowadays. On this spot opposite the “Church of Chains”, the Jews of Satu Mare were rounded up and deported in 1944. 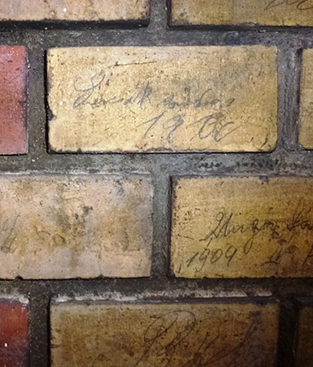 The signatures on the brick stones were the last signs of life of many of them. Up until today, handwritten names of the Jews can be seen on the stones.